We are sad to report that our dear friend and fellow Vintage volunteer Archie Archibald passed away on December 29th. Andrew Robert Archibald “Archie” was born in Compton, California on November 14, 1947 to Robert and Josephine Archibald, the only boy and youngest of four children. He was 65 when he passed away on December 29, 2012. Andrew grew up in South San Gabriel, California, graduating from Don Bosco Technical High School in June 1965. He enlisted in the Naval Reserves in 1967, served on active duty for three years from 1969 through 1971, and was discharged in 1973. He married Jill O’Rourke on November 10, 1988 in Tahoe, California. Andrew and Jill have been residents of Ferndale, California since 1976. While a resident of Ferndale, Andrew served on the local rural water board as a volunteer and gave a loving home to many, many stray dogs and cats. Andrew worked as a truck driver for most of his career. Andrew and Jill enjoyed many years driving his 37 ford to various events. 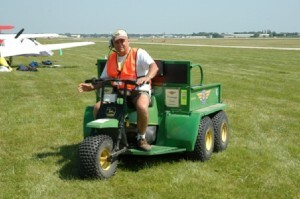 For the last 14 summers they headed to AirVenture Oshkosh in Wisconsin. Andrew and Jill have been “Vintage family.” Archie was the green machine taxi driver for the Vintage Aircraft Association. Andrew is survived by his wife, Jill Archibald (VAA’s ace volunteer at the Volunteer kiosk), his stepson, Parker Walworth, Parker’s daughter Kristen Walworth, two sisters, Joanne Hawke and Janice Penix, and 23 nieces and nephews. His sister, Joyce Amick, passed away in July 2011. Archie’s brother and sister-in-law, Phil and Pat Blake are also part of our Vintage volunteer family. A fellow volunteer, Al Hallett, writes: I remember Archie as one who was ready, willing, and able to do any job requested of him. He was of a quiet and gentle spirit. I never saw him lose his temper or get angry [I’m not saying he didn’t, I just never saw it!]. I enjoyed stopping by his campsite and sharing a coke or a water as we tried to solve the world’s problems [Obviously, we never succeeded!]. I considered him as a special friend as I’m sure so many others did! His passing to me is akin to losing a brother. Andrew will be truly missed by his family and friends.